Continuing the recent trend of stealth-releasing chapters of Jonathan Hickman’s epic, this week’s Avengers has the added distinction of being the most speculated installment yet. Curiously featuring the repurposed cover to 2002’s Ultimates 1, there is actually very little interior content that could otherwise prepare the reader for what’s in store without ruining massive surprises. Narratively, it’s a bit of a sidestep from the usual splintered dysfunction of Earth’s Mightiest, focusing instead on other aspects just as integral to the bigger picture of the upcoming Secret Wars. Purists may argue if this portion is indeed even properly classified, as no Avengers appear, save for a brief callback to events from the larger-than-normal issue 40. However, like it or not, a great deal of information comes to light and it is best handled here in an upfront manner rather than clumsily shoehorned at some point down the road. Without revealing too much, about half of the pages do in fact transpire within the Ultimate Universe (Earth-1610). However, beyond their representation on the cover, the Avengers of that world (the bygone “Ultimates”) don’t factor but current breakout star, Miles Morales, the Ultimate Spider-Man makes a page one swing-by cameo. It’s superfluous but this bit of scenery setting is enough to merit him his own circle on the often-overwhelming “Cast” page. Ultimate Nick Fury somewhat serves as de facto narrator, delivering vast quantities of “as you know” expository dialogue in the book’s introductory sequence. This is essential and much appreciated background filler to anyone who is not as well-versed in Marvel’s other main timeline. Although not a direct hand-off, the “crash-course guided tour” baton passes from Fury to a far more sinister denizen, underscoring the vast differences in the parallel Earths. It also suggests that a culprit may at long last stand revealed for the inciting incident of the Multiversal Incursions. And if this individual is not the inciting culprit per se, they are clearly identified as a villainous party of increasing central significance. This is a point that is in no small way highlighted, bolded and punctuated with about a billion exclamation marks by the reveal on the closing pages. In short, it also makes the anticipation for the Secret Wars collision that much greater as some real interesting allegiances are afoot. Artwise, Mike Deodato handles the issue with his usual top-shelf equanimity, ably accompanied by mainstay color artist, Frank Martin. 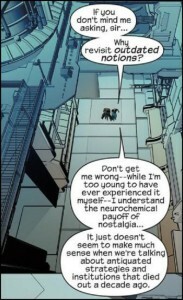 Of particular note, though, are the panels referencing and supplementing action from issue 40. In the first sequence, Deodato does a steroid-infused interpretation of Stefano Casselli’s original art. Shifting angles and layouts, he decisively re-envisions the drama with such commanding presence that it actually eclipses the initial work. However, as events continue to reframe, there is a glaring omission that persists. Without being too spoiler-heavy, suffice to say there is talk of a certain puncture wound yet no visual representation. Healing factors could be in play, sure, but physical evidence should manifest as well. Especially when the offending artifact got all that “big deal” build-up last time. So, with the most inscrutable chapter now in the rear-view, the remaining prelude episodes now number in the single digits. As evident from the last few issues, key components are now coming fast and furious from obscure and unlikely places. It seems like a breadcrumb trail was always there but few, if any, would have connected all of the dots and certainly not in this manner. This issue may not have been the linear continuation expected but it did enrich as an invaluable educational tool. Rather than viewing it as “wheel spinning”, it’s a shockingly necessary examination of the metaphoric (and literal) “equal and opposite”. This will make this inevitable clash all the more compelling and maybe make you wish there’s some way to fast-forward through the next three months. As evident from the last few issues, key components are now coming fast and furious from obscure and unlikely places. This what the toughest tap dance yet! 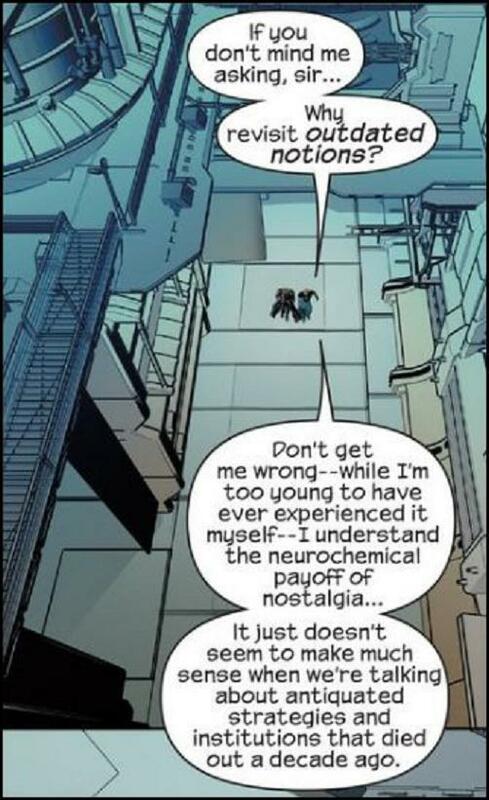 Personally, I’m fairly unfamiliar w/the 1610 so this was a great distillation of everything the layperson needs to know w/o it resulting in some weird expository flashback thing in Secret Wars proper. I’ve read trades of Ultimate Spider-Man here & there. Great stuff & consistently awesome. I’ve also read both volumes of Millar’s Ultimates and the Marvel Zombies arc of Ult Fan4. That’s about where I stop. Therefore, I vaguely remember hearing Hickman having a short run but didn’t key in that it would be anything pertaining to his 616 epic. Then I read up on The City as it is one of domains of the upcoming Battleworld. That lead to some reading up on the later adventures of that Reed. 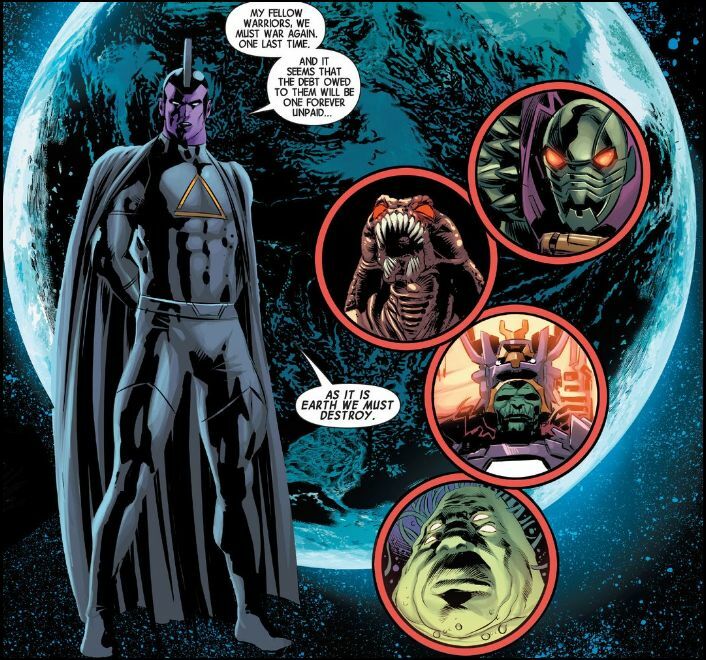 And I was wondering what a Thanos/Doom uneasy alliance would be like. Think this is maybe scarier?? First, credit to you for not spoiling anything and yet I somehow knew exactly what you were talking about. I don’t think you even used the R-word, which is fairly impressive. I loved the turn this issue took, and immediately followed up the read with all twelve issues of Hickman’s Ultimates run. There was a brief 15 minutes after where I tried to conquer the world, but it only really made the local news. The pace this series has hit as it approaches Secret Wars is exhilarating. I can’t get enough. 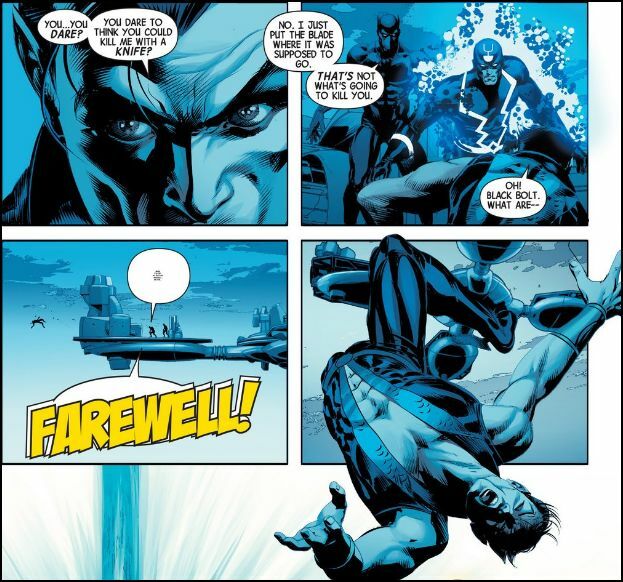 There is a small part of me that wishes we had time for Hickman to expand on all these additional stories (Cabal and You-Know-Who, Ant-Man, Franklin, etc) although maybe that will still happen and he’ll keep the pace. We’re only mortals, so I’ll leave it to the man in charge.